Authentique Paper and Canvas Corp are teaming up over the next couple of days to bring you tons of inspiration using Authentique Paper and Canvas Corp products! After you check out the projects here on the Authentique Paper blog, be sure to head on over to the Canvas Corp blog to find out what the talented members of their Design Team have in store for you today! Good morning Authentique fans...Guisepppa here, to joining in on the Cavas Corp Hop. I have only made one other painter's tray before, so when I received this tray from Canvas Corp I was so excited to get crafty. I used the Thankful Collection and pictures of my family. I thought this would be perfect because Thanksgiving is coming up and my family is definitely the thing that I am most thankful for. I love dimension on my projects, so as you can see I created a lot of dimension in all of the windows. Here's a look. The canvas tag makes a great layering element, and a neutral spot for my title. The waxed cotton cord (also Canvas Cord) adds a nice bit of texture. I die-cut a few shapes from the papers, to add to the stickers, for embellishment. Authentique papers, letters and stickers from the Thankful collection. Be sure to check back every day this week for more project inspiration! We have an Authentique Prize Pack to give away to one of our lucky commenters (please leave unique comments!) Also, make sure you stop and visit us as well as our friends over at Canvas Corp for prizes and lots of wonderful inspiration coming your way! Also, make sure you stop by the Canvas Corp Facebook Page and tell them Authentique Paper sent you! I am loving both of these projects! Absolutely gorgeous!! Fantastic! The painters tray is so interesting w great details... The canvas stamped leaves is super creative! Love them both! I love how the painters tray has all those individual unique scenes and the layout has so much texture and dimension to it! Lovely projects! Gorgeous printer tray! Love all the details! The stamped canvas looks fantastic! What a great idea! JJ...your canvas is absolutely stunning! Love the stenciling! I like the texture and colors in both projects. Family is something really to be THANKFUL for! love the dimension, like the fence & bird! Love the ideas on the painter's tray! 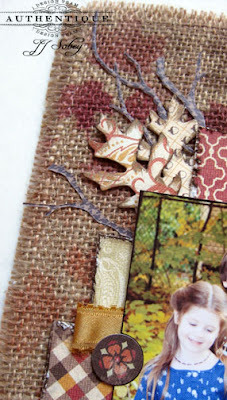 And the layers on the burlap page are amazing!!!! Love love love these projects! I love what Guiseppa did with that painter's tray - I need about a dozen of those trays! Also LOVE JJ's background of leaves on the burlap behind those fabulous papers and adorable pics! Thanks for the inspiration! Wow, blown away by the dimension and details on these projects! Living in South Texas, means I don't get to enjoy a fall season the way we did up North. I'm loving all these fall pictures and projects. Lovely work ! Canvas Corp burlap sheet is perfect for creating texture and interest to a layout!!! nice. Both project are great, that printers tray is perfect, one for each season of the year!!!!! Another gorgeous tray. Love the house she created. 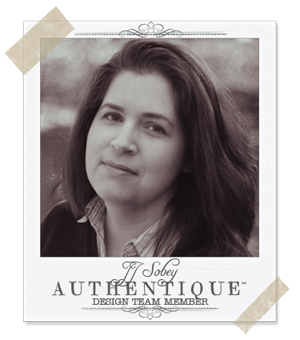 I also love the burlap background for the layout. Beautiful tray and page! Wonderful elements included in both! Gorgeous work Ladies. I love the tray with all the details and the layout..such amazing layering! Every time I visit, I get inspired to try a new project! I am so happy to see another painter's tray!! I love all the dimension!! thank you so much for sharing!! I can't wait to dust mine off! Love this project. The misting on the burlap is just beautiful. Beautiful projects! I love the stenciling on the burlap sheet. Very pretty. The details in the painters tray are amazing! So cute! Thank you for sharing these wonderful creations! Both projects are so lovely. Love the stamped leaves on the canvas background. Love today's projects! Great texture on the layout and the shadowbox is so sweet! Love the house and tree compartments! The painter's box is fabulous. I do love all that dimension inside each box. And the burlap layout...I didn't realize you put that much texture on a layout. So much inspiration with different products today...thank you. The projects are drop dead gorgeous! 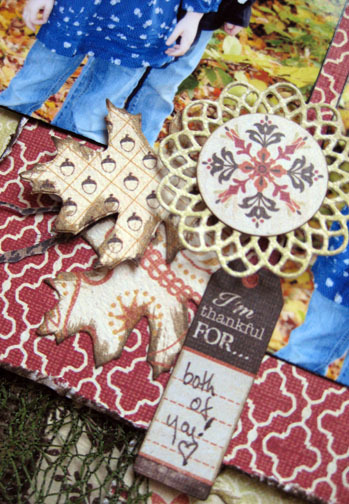 I was thinking of using the Thankful collection for Thanksgiving Layouts. After seeing the painter's box it occurred to me.. the Thankful Collections coordinates with my Living Room colors and how beautiful that would look in my living room! Not just during the holiday season but everyday. Now ..I want to make one! Wow, simply gorgeous projects! The tray looks truly amazing and I really love the lay-out too. Beautiful work, girls! Seppa I'm just in love with all of the pretty die-cuts that you did for the tray...I need that tree!!! JJ, the stamping on the canvas looks AMAZING! I will try that! Today's projects are another day of WOW!I really like them both! Such beautiful projects Ladies!! I absolutely LOVE the burlap page!!! Beautiful projects - so inspiring. Wowsa! Fabulous projects, I love all the detail. I love the Printer Tray! It is great for this time of year and can be a family tradition each year. It is simple yet so full of "eye candy" I always think the tray should be "over the top" with lots of "stuff" but I really like this tray. Great Job. I have wanted the burlap but wasn't sure how to use it. Thanks for great inspiration. I have some ideas to try. Thanks so much! beautiful painters tray, love the layering and details of the tree and frame. wonderful layering on the burlap layout, great colors. thanks fo rsharing and the chance to win. The colors and textures of these projects and papers is amazing. Love it. Love the painter's tray!! What a beautiful project to display. i love the painter's tray. there are so many different "entries" that it is a scrapbook! I love the dimensions and the rich textures on both of these projects! Love the idea of the canvas tag! I've been a HUGE fan of Guiseppa's creativity for several years now ... love her creative style. And JJ's project is choc full of so many lovely elements and colors! Simply lovely! That painter's tray is gorgeous!!! I love the Thankful collection and JJ's burlap sheet is stunning!!! Love the colors!!! Cute projects. 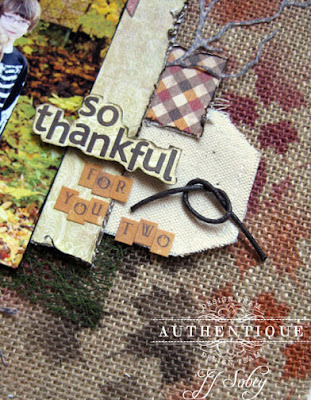 Love the warm colors and the stenciled leaves on the burlap bg!!! Wow ...these are so beautiful . I love all the lowering on the burlap along with the glimmer mist leaves . Great work . TFS . That should have read ...layering . Burlap is awesome on layouts....love the layering and misting on the layout and that painter's tray is very inspirational....I love the tree! Such an awesome lo with that burlap. I love that tray. It will make a great home decor piece for Thanksgiving! Gorgeous projects!!! I am inspired to make the tray for my home---love the LO. both projects are stunning - the layers of pp on pp in Guiseppe's project without being overwhelmed, is an art. And JJ's misting on the burlap is gorgeous and such texture with the burlap base! Both projects are so amazing!! You have inspired me to re-make my little box that is just like yours. So cute! Each of these projects is so tremendous - the 3D elements on the tray & the misted burlap are what I really noticed!